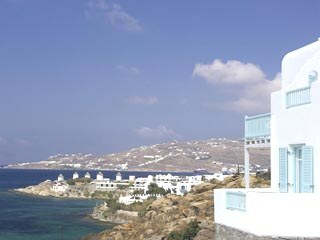 The town of Mykonos is a maze of dazzling, white cubic houses tumbling down jumbled streets, painted balconies bursting with white hibiscus and pink oleanders, overlooking miniature squares shaded by acacia, eucalyptus and assorted trees. Getting lost in the haphazard play of blinding light and violet shade, you might run across one of the town's 340 little Orthodox chapels, or stumble upon a row of white-washed windmills, or find yourself right back at the tiny port ringed with tavernas, watching the sun set through a cloudy glass of ouzo, as an island breeze stirs the evening air. Then the night begins, the streets begin to fill with exotic people. Be aware during the summer months that this place might become claustrophobic, so find a little corner restaurant to escape if you need to. 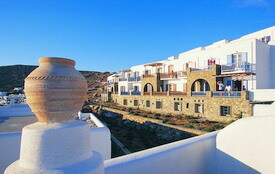 Apanema Resort is located on the waterfront, just 10 mins by walking away from Mykonos town. It only has 17 spacious rooms and 3 suites, this making the common areas never crowded, while the surrounding feels cozy and relaxed, a rather soothing contrast to the upbeat lifestyle of Mykonos. Belvedere is a new five star hotel that represents the most modern luxury at the best site, right in the heart of Mykonos Town. The unique cycladic architecture and the magnificent view of the picturesque city and the Aegean sea promises its customers an unforgettable stay. Bill & Coo Suites and Lounge is a luxury boutique hotel complex of 24 magnificent contemporary Suites in Mykonos, lying above the beach of Megali Ammos, about a few minutes’ walk from the centre of Mykonos Town. Facing the magical Aegean Sea’s sunset, this amazing couple hotel in Mykonos is a great tip for fashionable travelers planning a romantic vacation or a honeymoon in Mykonos, the most cosmopolitan Greek island. The Cavo Tagoo hotel, winner of the First Prize of applied Architecture in the Aegean Sea region, is ideally situated by the sea and only a stone's throw from the town of Mykonos. 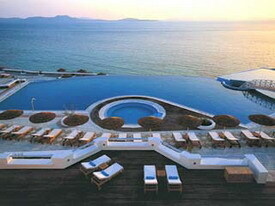 Cava Tagoo is a unique 5 star luxury hotel just 600 meters from Chora that is built into a cliffside. With its luxurious barefoot chic aesthetic, its distinctive architecture, versatile services, and respect for traditional elements, CAVO TAGOO unfolds as an unparalleled experience to its guests. Featuring suites with private pools, a Spa Center, indoor heated pool, fitness center, stunning lounge and poolside bars. Greco Philia, situated on the dramatic cliffs high above Cavo Elia, offers beautifully appointed suites, villas and apartments equipped with king and queen sized beds, satellite television, and the finest in Myconian styling. 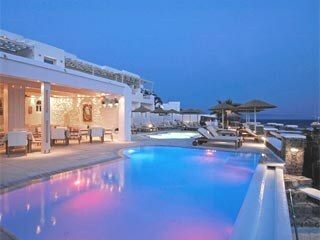 The luxury resort, located in the largest,and most famous beach in Mykonos, Elia. Enjoy the stunning views of the sea and beaches, the cliffs of Mykonos, and the picturesque Mediterranean with the islands of Naxos, and Paros silhouetted against the horizon. A matrix of beautifully landscaped gardens, local stone arches, stairs and passages link our pool, bar and common areas. Boutique elegance and detail to service is what this hotel is about. The Lobby entrance is decorated with murals and glass in an array of colors and beautiful furnishing which follows to the rooms and suites. Over the years the grounds have fourished with the artistic style that the interiors have. When you start with that amazing breakfast you know that the rest of the cuisine will follow accordingly. Please note the rooms are small so if you can go for deluxe or the dreamy suites. Mykonos Ammos Hotel is ideally located by the magnificent Bay of Ornos, just on the beach front, where the Cycladic architecture meets the deep blue Aegean sea and create the ultimate summer environment. Adapted to non stop Mykonos' evolving lifestyle, this beachfront hotel will welcome its next season's guests to its brand new, fresh and absolute modern ambience, offering at the same time its optimized services and facilities. 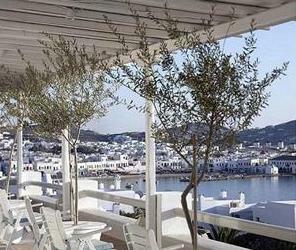 This renovation,intends to transform Mykonos Ammos Hotel to the island's next hot spot. The Mykonos Grace is an intimate, exclusive boutique hotel located just north of Mykonos town above the sandy and protected beach of Agios Stefanos. 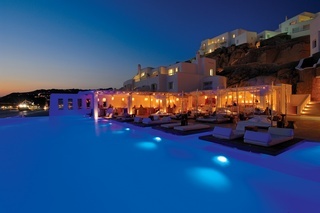 Guests at the Mykonos Grace are treated to an ideal setting, comprising luxurious facilities and intimate hospitality for a unique experience at the hotel as well as throughout a relaxed and pampered Mykonian island holiday. The graceful coexistence of traditional architectural elements and local craftsmanship with modern facilities and simple but elegant design touches is apparent throughout the property. The reception area with nuances of the Aegean Sea, the stylish pool-side area adjacent to the Grace bar & restaurant, the refreshing spa and the gym combine to create a special holiday or romantic honeymoon in mykonos. This luxurious resort is located on the beach of Ayios Yiannis, (where the movie Shirley Valentine was filmed), just 4,2 km from Mykonos Town with the shopping areas and the world known night life, 4,5 km from the airport and 4,6 km from the port. 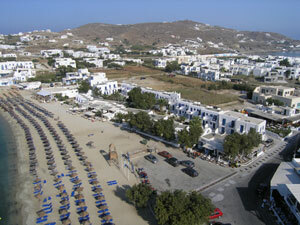 Just 50m from our hotel entrance you can find the local transportation to Mykonos Town or to Ornos Beach. Everything composes an unforgettable picture. Aesthetically perfect premises, breathtaking nature, warm and kindhearted people with a tradition of excellence in service, dedicated to your well being. The Pietra e Mare, is situated in Kalo Livadi, one of the most beautiful beaches of the island, 12 km from Mykonos Town, overlooking the Aegean Sea. 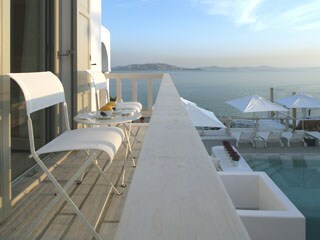 Its 30 rooms combine the fine elegance and the luxury of the Cycladic tradition with modern facilities. 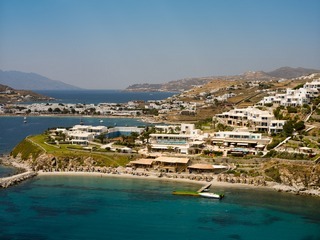 Saint John - Mykonos is the new ultimate summer resort created just for those who demand only the best for their vacation. The newly built Saint John, is a 5-star deluxe complex of Superior rooms & Suites, Villas and Standard hotel rooms. 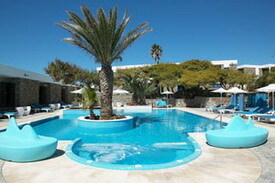 The resort extends on 20,000 m² of land in the area of Agios Ioannis, in one of the best locations on the island. 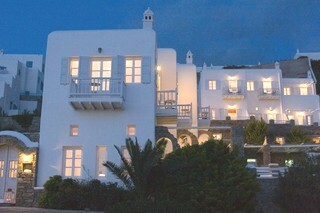 The Saint John Hotel, Villas & Spa offers all the pleasures of Mykonos combined with the luxury of a five star resort. Ideally situated over Aghios Ioannis Beach, only 4.5 klm from the town of Mykonos and 4 klm away from the airport, Saint John resort offers a breathtaking view of the Aegean and the island of Delos, the mythical place where Apollo and Diana, the children of Zeus were born. Hotel and villa complex boasting a choice location, elegance in its decoration and interpreting the Mykonos holiday with flair and imagination. Standard rooms have had recent renovations and offer more privacy, (terraces rather than balconies) while deluxe rooms have vast views from balconies. The Private villas with pool range from two bedroom to four bedrooms and offer the client all the privacy of ones own villa with all the hotel services available to you. Special arrangements can be made for personal services needed for villa stays. Beautifully decorated and appointed hotel that provides you with peace and quiet in for central location to town. Private villa built on its own landscaped garden, part of a complex called Myconian Villas on the slope of Aghios Ioannis, opposite island of Delos. Built in ture Myconian architect with villa offering modern comforts at a enjoying wonderful views to the sea, particularly beautiful at sunset. Caretaker and staff living at separate quarters look after the guests whenever required. Welcome basket is arranged for first morning but shopping can be prearranged as well as during time there. A/c not through out unit only in bedrooms but portable fan in salon area. Semi-private villa residence, part of an entity of 4 similar villas sharing one pool, built on a slopping land, part of a larger property called myconian villas on the slope of Aghios Ioannis, opposite the island of Delos. Mykonoian architecture villa offering modern comforts at a enjoying wonderful views to the sea particularly beautiful at sunset. Caretaker and staff living at separate quarters look after the guests whenever required. Clients ae greeted with welcom packet for first morning but additional food shopping can be prearranged. Negative is not fully a/c but contact us for 2003 they are discussing installing.